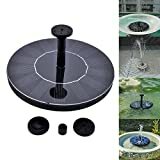 No electric outlet or battery needed for the floating solar fountain. This product floats on the water and starts pumping water soon after bright sunlight shines directly on the solar cells. Use of solar energy, runs automatically, no battery or electricity needed, just the sunshine. Solar-powered pump with monocrystalline solar panel, automatically pumps water in a few of seconds in the sun (enough sunshine). suitable for garden decoration, bird bath, fish tank, small pond, water circulation for oxygen. 1. The water pump will not working without sunlight, it will restart within three seconds once the sunlight re-appears. 2. Change water frequently to keep the water clean to avoid any dirt impeding the pump.